You've got your airline ticket in your pocket and you're headed to the Caribbean! The only thing left to do is to choose the right accommodations for your stay in Guadeloupe. You'll also need to rent a car in order to be free to move around the island as you wish. Let us organise your holiday in Guadeloupe, we have prepared a wide selection of superb holiday villas for you—there's something for everyone! We put QUALITY first! Why is renting a villa in Guadeloupe the ideal solution for your holiday? A holiday villa in Guadeloupe ensures you total freedom. It's just like being at home except you'll have the sun, beach and coconut trees as a bonus. You'll experience and enjoy your holiday at your own pace without being required to have breakfast and lunch at specific times like in a hotel. Many of our holiday rentals in Guadeloupe have a sea view or are located close to the island's most beautiful beaches. There is a wide selection of accommodations to choose from in Guadeloupe so you'll have the choice between a villa with a swimming pool, a luxury villa, a beachfront rental or an appartment or charming bungalow. Why choose Villaveo to book your holiday in Guadeloupe? We devote significant attention to the quality of our selected holiday rentals in Guadeloupe. "We've found the location, it's up to you to create the memories." Don't waste your time sifting through all the offers posted on the internet.Just let us know exactly what you'll need and your trip wish listand we'll find accommodations just for you.Are you planning a family holiday in Guadeloupe? Or a stay with friends in Guadeloupe? Or perhaps a romantic getaway for two on one of the islands of Guadeloupe? We have explored the islands of Guadeloupe from top to bottom looking for accommodations that will make all the difference. Whether you choose a stay in Grande-Terre, or a stay in Basse-Terre or a getaway in Marie-Galante, we'll be able to find what you need. When should you book your holiday rental in Guadeloupe to have the widest selection to choose from? If you are looking for a large villa such as Villa Fleur de Canne or Villa Nirvana, which are just perfect for a family holiday or a stay with friends in Guadeloupe, these villas need to be booked a good 8 months in advance. It is important to plan this kind of holiday well in advance. For a smaller villa or an appartment or bungalow, reservations should be made at least one month in advance. The peak tourist season in Guadeloupe ranges from mid-December to mid-April. For a stay during this period, be sure to book at least 6 months in advance in order to have the widest selection possible to choose from for your holiday. If you have to travel during school holidays, you'll benefit from the best rates and a wide choice of accommodations. Be sure to consult our last-minute trip to Guadeloupe section. Renting a car is a must during your stay on the islands of Guadeloupe if you want to discover the diversity of the landscape. You can travel from one island to another in no time at all. For example, it takes about one hour to reach the extreme northern tip of Grande-Terre with Pointe-de-la-Vigie from Sainte-Anne or Saint-François. And if you rent a villa near Saint-François, it'll take about 90 minutes to arrive at Malendure Beach in Bouillante on the Route de la Traversée close to Parc des Mamelles. If you really don't want to rent a car, make a stay in Saint-François your first choice as you'll be close to everything there, including the marina and shops. You'll be able to walk to the Beach of Raisins Clairs or the Port of Saint-François to buy fresh fish. If you choose Basse-Terre, it'll take at least two hours to go from Deshaies to Volcan de la Soufrière for example. Where to rent a car in Guadeloupe? There is a wide selection of car rental options in Guadeloupe. It's best to book your rental car in advance. Discounts are often available by booking online on the car rental sites. You can rent your vehicle via traditional car rental sites such as Europcar, Hertz, Magaloc, etc. It should be noted that our partner is EUROPCAR and as a result you'll receive an additional discount by entering our promotional code when making your online reservation. You may choose to rent your car either directly at Pointe-à-Pitre Airport, or at the various agencies which dot the island in Gosier, Saint-François, etc. Some rental agencies even offer to drop the car off at your accommodations. You may also choose a car rental from a private owner.There is only one site we can recommend—Carfully—which proposes very low rates and all the guarantees that would be required to rent a car safely. What type of vehicle should I choose to get around the island of Guadeloupe? You can rent any type of vehicle you like.You won't need a 4x4 to get around in Guadeloupe. However, be sure to take into account your luggage in order to rent a vehicle with enough trunk space. If you're travelling with the family, renting a vehicle that seats seven is the best solution for getting around as a group. What is there to do during my holiday in Guadeloupe ? By opting for a holiday rental, you can enjoy your stay at your own pace and do whatever you choose! Isn't that what a real holiday should be?! A stay during which you can freely discover the islands of Guadeloupe awaits you. A relaxing holiday to explore the most beautiful beaches in Guadeloupe. It would be difficult to choose THE most beautiful beach in Guadeloupe, as there are so many beautiful ones to choose from. That being said, our favorites are the pristine beaches in the North of Basse-Terre. 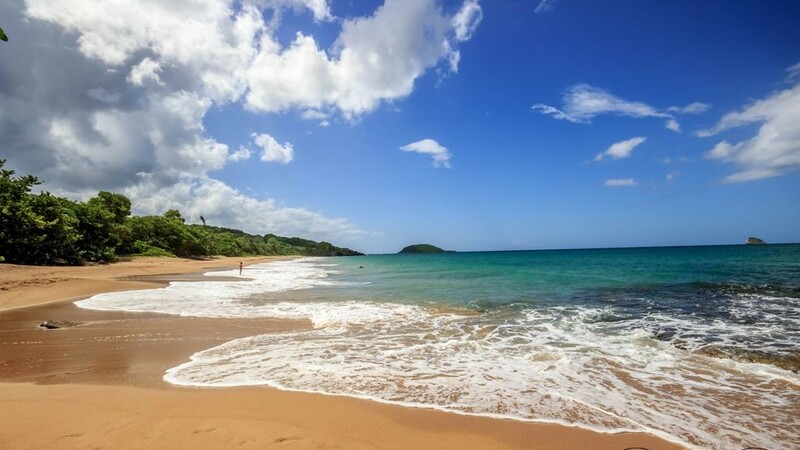 Some examples include the Beach de la Perle in Deshaies, where you'll find a stretch of golden sand just perfect for relaxing. In Grande-Terre, the Beach de Petit-Havre in Gosier is a real gem and the Beach de la Caravelle in Sainte-Anne is perfect for families with children as it's a great place to swim. A lagoon with turquoise-blue water, white sand, coconut trees—there's everything you'll need for an enjoyable holiday under the sun in Guadeloupe. By choosing a luxury rental with a sea view, you'll be able to admire the landscape for hours and take turns swimming in your villa's pool and the sea. You'll be spoilt for choice. Guadeloupe is teeming with breathtaking landscapes offering great diversity. The islands of Guadeloupe provide a complete change of scenery. Basse-Terre features unbelievable natural landscapes and is the perfect spot for hiking enthusiasts. It abounds with cascades, natural waterfalls, ponds and lookout points offering stunning views of the sea. Be sure to visit some of our favorite places such as Bassin Bleu in Gourbeyre, Saut d’Acomat in Pointe-Noire, Chutes du Carbet and Cascade aux Écrevisses. Make no mistake, the North of Grande-Terre is just as impressive with the steep cliffs of Pointe de la Vigie and the craggy landscape of Porte d’Enfer in Anse-Bertrand. Visit one of Guadeloupe's most popular sights—Pointe des Châteaux and treat yourself to the best coconut sorbet on the island at Chez Jeannette! Climb the Soufrière volcano. Visit at least one distillery during your stay in Guadeloupe (Bologne, Karukera, Damoiseau, Severin etc.). Relax on the beach in the town of Sainte-Anne, visit the archipelago of Saintes and enjoy a timeless day in Terre-de-Haut. You'll be enthralled by the pristine beauty of the beach of Anse-Tillet in Deshaies. Swim with the sea turtles on Malendure Beach in Bouillante. Immerse yourself in the Cousteau Underwater Reserve. Admire the most beautiful sunset from the town of Deshaies. Stroll through one of the island's night markets and breathe in the aromas of the spices from the islands of Guadeloupe. Taste a grilled lobster at "Colombo" restaurant in Saint-François. Be overwhelmed by the savage beauty of Pointe-de-la-Vigie in Anse-Bertrand. Head out to sea and spend a Robinson Crusoe day on the island of Petite-Terre. And … get away from it all on the island of Marie-Galante and the most beautiful beaches on the islands of Guadeloupe. Have I already told you how much I love the islands of Guadeloupe? And if you can't decide between Grande-Terre and Basse-Terre, you can opt for a combination of the two. We'll be able to provide you the best selection of holiday rentals for each island. "Guadeloupe … is not just one island but many."